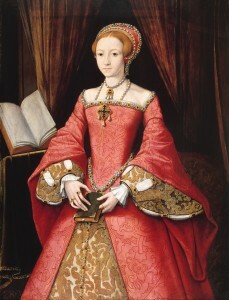 I was reading a book about Elizabeth I, and it got me thinking about her mother, Anne Boleyn. More specifically I was thinking about her death. Would it have at all been different if she had been able to conceive a son? It appears all her husband wanted was an heir. If a woman has a daughter, and becomes an unwanted wife, what happens if she should have a son afterwards? Does she become the favorite again? What if a wife who desperately wants to save a marriage manages to give birth to son after a daughter but is unable to repair things? The son was not the answer. She would regain her husband’s favor and undivided attention for a week, maybe a month. Then what? Would she be cast aside to have her head cut off just the same? Everyone can recall the official charges that lead Anne Boleyn to her execution. But what is of more interest is how everything unfolded from the beginning, leading up to that point. When did things start to fall apart? There are myriad histories written about Anne, from as many perspectives, but all can agree that she never gave up. What if she had? For her there was too much at stake; hers was not an ordinary marriage. Yet if we strip her of her crown and make her a common woman, her problems would have remained. She would not have died for her alleged sins but her existence would have been unbearable. She would probably at one point have had a son, only to be greeted with the same indifference. Which was worse? Yes, I was reading the history of Elizabeth I, but perhaps I was reading the wrong book.